Apple Graphics is currently working on a wrap for Total Home Improvments. One of the company's vehicles, a Chevrolet Silverado was involved in an accident. The insurance company covers both the vehicle damage as well as the vehicle wrap. Any part of a wrap that gets damaged in an accident is covered by the insurance. Total Home Improvments has a fleet of company vehicles. They come to Apple Graphics to not only get their vehicle wrapped, but also to maintain their brand name. A company's branding is extremely important, since that is how consumers know them. Apple Graphics is currently working on a truck wrap for a 2010 GMC Denali. So far with THI, we have done a full truck wrap on a Ford F-250, a vinyl lettering job on a Ford F-150, and now a wrap repair on a Chevrolet Silverado. Apple Graphics has done a few wrap repair jobs, such as a Nissan Sentra for RentABody. The client was rear-ended so we replaced the trunk and rear bumper of the wrap. Most repairs are a quick and easy installation, since we have the design already set up and ready to print. We frequently get asked if a wrapped vehicle is involved in an accident, does the insurance company cover the repair. The answer is YES! We will match the exact design, making it appear as if nothing ever happened. It is especially important for fleet vehicles to match the original design since they all must look the same. When it comes to getting in an accident with a wrapped vehicle, the insurance company will handle the cost, and Apple Graphics will handle the wrap repair. Apple Graphics is forming a list of drivers and businesses in the Tri-State area that are interested in Mobile Advertising and Vehicle Wraps. The biggest and most effective way to advertise a business and get noticed is with a Vehicle Wrap. Businesses are always looking for better and more creative ways to advertise and boost their business. On the other hand, there are millions of people who drive their vehicles throughout the day and in busy locations. 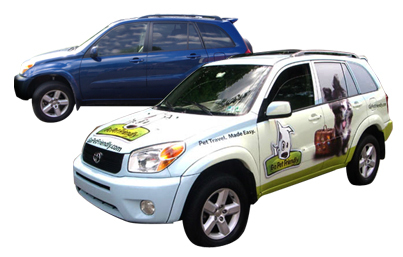 Why not turn your vehicle into a business's mobile advertisement and get paid for simply driving it? This is the new face of advertising. A person interested in driving a mobile advertisement will be matched up with a business that fits their driving route and area they reside in. After the client and individual is paired up, Apple Graphics will design and install a custom vehicle wrap. For businesses, this concept is a 'no-brainer'! Any business can have an individual drive their mobile advertisement and promote their business 24/7! For individuals such as stay-at-home moms, businessmen, and salesmen that drive often, they can now get paid while they are simply driving! Call Apple Graphics to get on this list! Apple Graphics has a special advertising opportunity! We have a 53 ft. 18 wheeler that travels from Philadelphia to Ohio and back once a week. Apple Graphics is renting advertising space on this trailer. 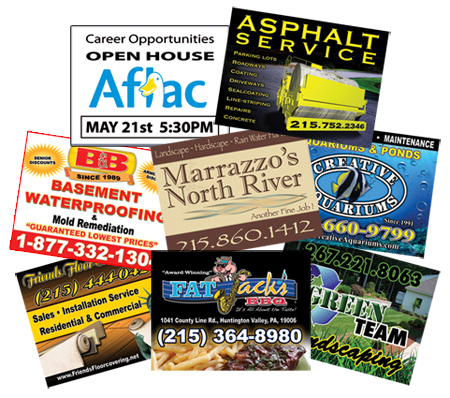 It is a great opportunity to advertise your business! Call Apple Graphics for pricing and more details about this special opportunity.